Poland (.pl) announced last week that it joined the million domain club by registering its one-millionth ccTLD. The reason for the sudden surge in registrations is Poland’s easing of the registration process by adding partner registries. There are now 95 registries for .pl including 37 of these based outside of Poland. 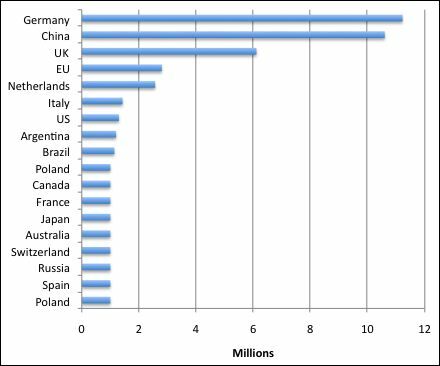 Here’s a chart of all countries with more than one million registrations. I also included the EU in there. I did not include Tuvalu (.tv). I expect China to surpass Germany in the next two weeks. For the ultimate country code reference, see the Country Codes of the World poster.